(MENAFN - Gulf Times) KidZania Doha and Al Aziziyah Boutique Hotel have partnered to create a kid-sized hotel inside the 5,500sqm educational and entertainment facility, it was announced. KidZania is an award-winning educational and learning concept while Al Aziziyah is a five-star property currently acquired by Aspire Zone Foundation and managed by The Torch Hospitality. The co-operation between the two companies will help children pay close attention to details, boost their organisational skills, the ability to communicate well with guests and their colleagues, and the discipline of upholding five stars service excellence. Inside the hotel, children can role-play as housekeepers, waiters/waitresses or receptionists and engage in tasks like arranging the bed with linens, pillowcases, duvet cover and bedspread, ensuring the room is cared for and inspected according to standards. As waiters they will learn how to arrange tables to five-star standards and appropriately communicate with the guest to ensure satisfaction. Also, as receptionists they will learn how to greet and register guests. 'KidZania strives to co-operate with international and local brands and companies. 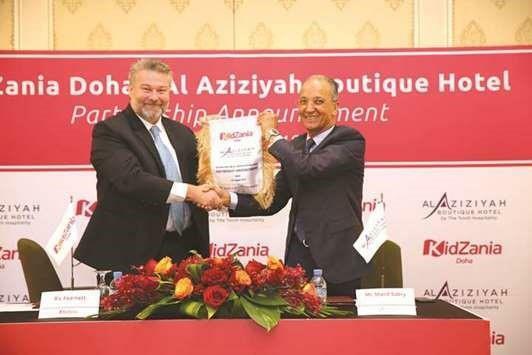 Our partnership with Al Aziziyah Boutique Hotel will provide a strong platform for communicating with future generations and upholding service excellence, KidZania governor Ric Fearnett said. The Torch Hospitality Group's area general manager Sherif Sabry said: 'We are confident Al Aziziyah Boutique Hotel activities within the city will offer children a unique experience in immersing them in a real-life setting and will help them to think and react like a professional of the hospitality industry. KidZania Doha, which is expected to open its doors by the end of 2018, will provide a unique educational and entertainment experience with 42 establishments. Children aged between four and 14 years old will be able to role play ‘adult jobs' in up to 60 pretend roles, learning a variety of values, including self-reliance, team work, honesty, integrity and giving back to society. KidZania is the world's fastest growing family entertainment brand, with KidZania Doha expecting to welcome more than 300,000 visitors year-on-year. The establishment will be able to accommodate up to 1,000 children with approximately 250 employees at a time.